There is No Place Like Home! : There is No Place Like Home - Delta Sigma Theta Eta Omega SJSU! There is No Place Like Home - Delta Sigma Theta Eta Omega SJSU! Delta Sigma Theta Sorority was founded in 1913 at Howard University by 22 industrious college women who demonstrated a vital concern for social welfare, academic excellence, and cultural enrichment in order to de-emphasize the social side of sorority life. In November of 1970, four women saw the need for an organization of college women on San Jose State University's campus that emphasized social welfare, academic excellence, and cultural enrichment in a time when social change in the Silicon Valley was at an all time high. Inspired by the sorority's 22 innovative founders, they set out to charter a chapter on San Jose State University campus. This initial recognition led to the birth of the Eta Omega Chapter of our illustrious organization. We strived to maintain the legacy of service that our founders envisioned. Since its chartering, Eta Omega has crossed 25 lines into our sisterhood. Although small, Eta Omega continues to persevere with Delta Sigma Theta's tradition of excellence as our inspiration.Every five years, Sorors come together to celebrate our chapter! We are very proud to have crossed at San Jose State University. We have some very good times on the campus. We come together to celebrate our sorority; greet Sorors we haven’t seen in 5 years or more. We see who is married/happily single, mothers and greeting the young Sorors who are still attending SJSU. We have a wonderful weekend filled with hugs, kisses, laughing, singing, dancing - just having fun! Our special weekend is coming up this month - October 22nd through the 24th. The agenda is full. We kick it off on Friday with private, 'Sorors' only event. On Saturday, we have our annual picnic; follow later on with our dinner and dance. On Sunday, after breakfast, some go off to church, others get ready to catch a flight or get in their cars to head home. We all leave hugging each other. It will be so much fun. I crossed the 'Burning Sands' on February 17, 1977. We pledged when pledging was 'something else.' We made it through. The most special thing of pledging is bonding. It is such an extraordinary feeling that will last a life time. I am the host of a radio show – ‘Speaking Your Minds with ZeeCee,’ it is an internet show located at BlogTalkRadio site. My show airs on the 4th Sunday of the month at 3 PM, PST. This time my show falls on the Sunday of our reunion. So I have invited my Sorors to join me on the on air. We will be talking about the joys of being a Delta and everything else. I'm imaging that it is going to be 'off the chain.' Sorors who call in will be able to talk or chat about everything Delta. The call number is 347.989.1309 or go to the website - www.blogtalkradio/zeecee to listen to the conversations. I'm looking forward to a very enchanting hour. I am blessed to be part of such a dynamic sorority. 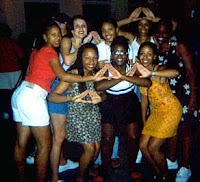 Being a Delta is very special; we are a group of ladies who are part of the 'true power'. We are college-educated women who perform public service and place emphasis on the African American community. The sorority governs a collective strength to promote academic excellence and to provide assistance to persons in need. This is why I pledged Delta. We pray for and we receive restoration. We follow our life path with energetic and vibrant zeal. We receive guidance as we center our thoughts on entering the secret place or the Most High. We have happy, joy filled hearts! -Namaskar – I behold the Christ in You!